At some point, all of us have sat face-to-face with a pile of fried fish or fried clams. 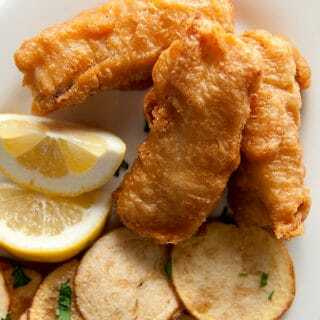 As this usually happens first when we are tiny tots, the experience can alter the course of our dietary existence: After that virginal fish fry, many of us we emerge either as committed fish lovers — or, like many Americans, committed fish haters. Only about half of Americans eat seafood more than once or twice a year, and I suspect that a big reason for such a gulf between fish eaters and fish haters is what was on that first plate of fried fish. Try to think back to your childhood now: Did your mom cook her own fried fish, or did she open a box and shake out a few frozen fish sticks? I have vivid memories of both cases. My mom cooked her own fish. I have a crystalline image in my head of mom busily frying flounder fillets. It must have been from the mid-1970s. She’s standing next to a pile of fried flounder, each layer separated by paper towels sodden with oil. We’d eat these with lemon and lots of “tah-ta sauce.” Mum is from Massachusetts. I also remember eating at some of my friends’ houses. That image is of pre-breaded fish sticks clunking out onto a foil-lined tray that somebody else’s mother popped into the oven, often a toaster oven. I remember these being dreadful. Fish sticks are eaten by those who do not fish, I soon learned. Over the years, I’ve become a connoisseur of fried fish, and I still seek out superior fish and chips wherever I go. Most recently I had some fantastic fried fish in Seattle, at a place called Pike Street Fish Fry. It was perfect. Low-budget atmosphere, cheap, crispy fries, lots of beer — and a perfect batter. Batter. When all else boils down, batter is why we love fried fish. Golden brown might be the two best words you can say in the kitchen (other than, perhaps, “More bacon?”), and the magic of a batter that is crispy, yet light, is a feat of culinary prestidigitation. The Japanese have their tempura batter, which is divine, but fish and chips need something sturdier. They need beer batter. While everyone has their own recipe, beer batters are all basically the same: Beer (what kind you use matters), flour and a little salt. Mom never battered those flounder she cooked; they were merely breaded and fried. Most fish sticks are the same. Why? 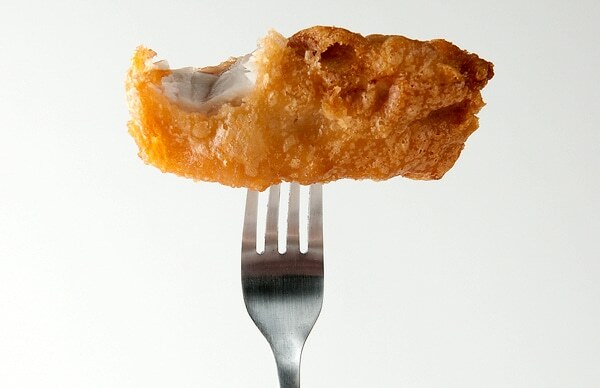 Batter can only be done properly with deep frying, and few Americans will deep fry at home. No one ever told me this, so I’ve happily been deep frying since I was in my early 20s. It’s not terribly scary, I assure you. So long as you watch temperature, you’re fine. Yeah, it can be sporty to have a half-gallon of 360°F oil roiling on your stovetop, but so long as you know it’s that hot, you’re fine. Bad things happen when you don’t, and the oil gets too hot. Thermometers are a must. I used to use a Dutch oven to fry, but now I use a DeLonghi electric fryer, which has lasted me years. I like deep fryers because they restrict the amount of vaporized grease that gets into the air. And while that aroma really adds to the ambiance of a place like Pike Street Fish Fry, its not so good in your house. A deep fryer also lets you control temperature, which is important. Soggy, greasy fish and chips happen because the oil was not hot enough. Oil that is too hot will burn the batter by the time the fish has been cooked. My sweet spot has always been about 360°F. Finally, there is the fish. What kind to use? I’ve eaten batter-fried fish six ways to Sunday, but all the best share a few characteristics: They’re all firm, white, and lean. 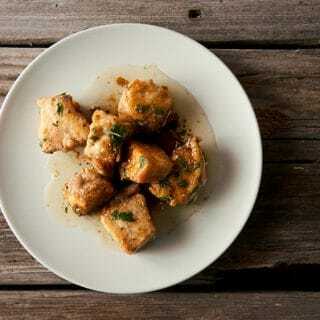 Cod, haddock and pollock are classics in the East, as is halibut or lingcod in the West. In Wisconsin and Minnesota, walleye and yellow perch are king. In the South, it’s all catfish until you get to the Gulf, where redfish take over. Hell, I’ve even used tilapia. But my absolute favorite? Shark. 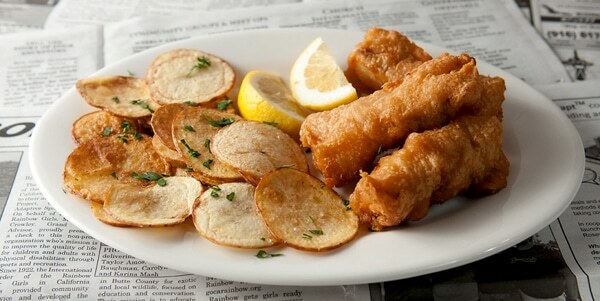 Dogfish and leopard shark are the perfect frying fish, and in fact are traditional in Northern England fish and chips. The meat is white as snow, very lean, and firmer even than halibut. And, happily none of these fish are threatened, so you can eat with a clean conscience. What’s more, eaten cold the next day, fish and chips made with halibut or these sharks tastes astonishingly like cold fried chicken. Go figure. A word on the chips: I am not very good at making my own French fries, which require double-frying. So instead I make my own chips, which I like just as much. Potatoes sliced just thick enough so the center is soft, just thin enough that a quick bath in hot oil will crisp the outsides. 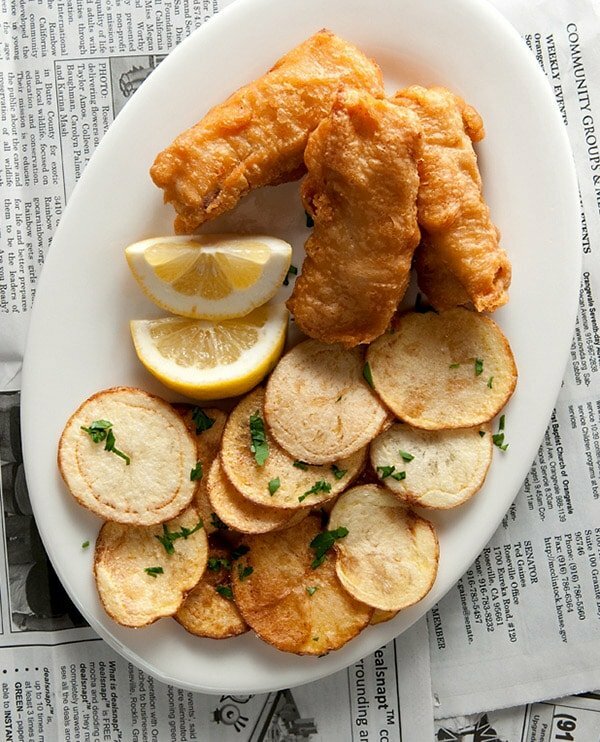 This is a recipe for a classic beer batter and fried potatoes. I typically make this with leopard shark, halibut, walleye, cod or catfish, but you can also use seafood like shrimp, calamari, oysters or clams. I use waxy potatoes like Yukon gold for the chips; I find they hold together better in the hot oil. Make sure your fish is fresh, your batter is cold, and your oil is hot. Make the chips first and keep them in a warm oven. Oh, and make more than you think you need. People love well-made fish and chips more than they think. Salt the fish and set it aside at room temperature. Get your oil going: You want it to be 350-360 degrees. Turn the oven to the "warm" setting, and put a cookie sheet inside. Place a wire rack on top of the cookie sheet. Mix the flour, vegetable oil, salt and beer together, stirring all the while. You want enough beer in the batter to give it the consistency of house paint, or melted ice cream. Put in the fridge to rest for 20 minutes. While the batter is resting, slice the potatoes and put them into a large bowl of cold water. When you are done slicing, remove the potatoes and pat them dry with a paper towel. The oil should be hot by now. Fry the potatoes, a few at time, for 3-5 minutes, or until they start to brown at the edges. Don't cook them until they are uniformly brown or you will overcook them; they will continue to brown a little out of the fryer. Salt each batch the moment it comes out of the fryer. Store each batch on the wire rack in the warm oven. When the potatoes are done, take the batter out of the fridge. Dredge the fish in the batter and let the excess drip off for a second or two. Lay each piece gently into the hot oil. Do this by letting the bottom end of the piece of fish fry for a second or so in the oil before you let the whole piece get a bath. This helps prevent the fish from sticking to the bottom of the pot. Keep a chopstick or something similar around to dislodge any pieces that do get stuck. Fry in batches until golden brown, about 5-8 minutes depending on how large the pieces are. Keep each batch in the warm oven while you finish the rest. Serve at once when you're done. Serve with lemon, beer and a sauce of your choice. Tartar sauce is a good idea, but remoulade is also good, as are aioli and the traditionals -- malt vinegar and Tabasco. You can find hundreds of recipes for all varieties of fish and seafood here on Hunter Angler Gardener Cook!